UN Secretary-General Ban Ki Moon visited Auschwitz this week. The Secretay-General pleaded for tolerance for Muslims during his visit. Ban Ki-moon visited the Nazi death camp in Poland on his way to Warsaw to attend a UN climate change conference. “I am truly overwhelmed and humbled. No words can adequately express my feelings. How can a state and individuals be so cruel and use systematic brutality against humanity?” Ban said, noting he’d twice visited Yad Vashem and the Holocaust Museum in Washington D.C. The Muslims are also happen to be rioting across Europe. 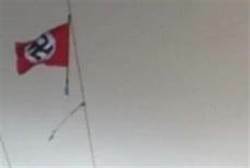 A Nazi flag flies in the West Bank south of Jerusalem earlier this year.